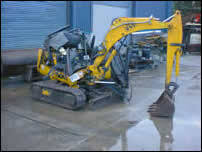 We can solve any mini-digger problem; parts are available from our vast stocks. 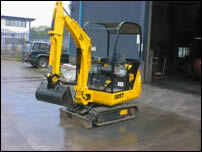 We can repair, rebuild or you can choose from our stock of used machines from three-quarters of a ton upwards. We know mini-diggers from top to bottom - any make any model. As a family run business, we were established in 1983, originally as general plant and machinery repairers. Following initial success, we moved to purpose-built workshops at Village Farm Industrial Estate adjacent to Junction 37 of the M4 Motorway. With the widest knowledge of all Construction machinery, we quickly established a reputation for quality and service. In recent years, we have begun to specialise in mini-diggers and pride ourselves that we are established as the best. Try us and let us prove it! Just take a look at the mini digger below, which was crushed when a gang of youths broke in to a building site and drove over it in another piece of plant machinery. Rather than scrap the digger its owners brought it to us where we restored it to its former glory.